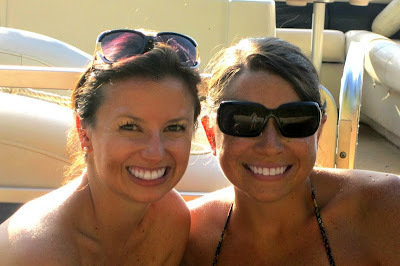 This past Saturday I went to Lake Norman with some girlfriends. We packed up the cars with food, booze, trashy magazines, and dogs, and headed up to Kristi's family lakehouse. After unpacking, we took the boat out and headed to an island where we beached the boat and just enjoyed each other's company for a few hours. What a fun weekend and I love that you guys brought all your puppies! Those are one of my favorite cookies as well! weekends with the girls are my absolute favorite!! What a fun time! My grandmother used to make these cookies. Yay for Lake Norman! Welcome to my home!!! How far is it from you anyway - 30 mins?? I want to be somewhere warm where I can wear a bathing suit and frolic like you pretty ladies! PS- Your eyelashes are REDONK. I want them! I use to make those cookies in high school all the time. We love lake days! Weekends with girlfriends are the best! Booze and trashy magazines?? Count me in! Also...love your cover-up!